In these uncertain economic times, it's more important than ever to have a source of sound financial advice. 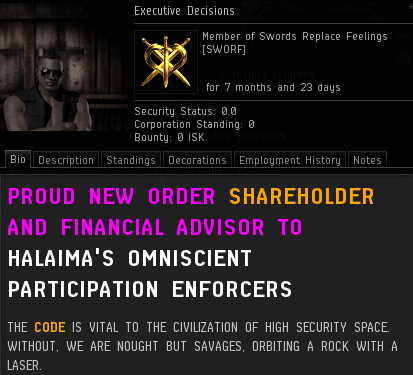 I received an EVEmail from Halaima's Omniscient Participation Enforcers (HOPE), which sounds like a promising corporation. We'll hear more from them later, but I was intrigued by their reference to having a financial advisor. Executive Decisions crunched the numbers for HOPE and calculated that their best bet was to lend him 100 million isk to buy some New Order shares. I haven't personally looked at their numbers, but my gut tells me that this was indeed the way to go. Executive Decisions' well-timed purchase of 100 shares sent us over the 208 billion mark and earns him (and vicariously, HOPE) a Supreme Protector's Tip of the Hat™. Before you know it, all highsec will be running like a well-oiled machine! it would be wise to tell all of Executive Decisions corp / (if exist alliance) members that he wasted money in a ISK Bonus room for absolutely nothing. Just because you posted that, I'm buying a hundred shares. Is it a waste of isk for me to donate to a streamer or podcaster? I don't think so as you get something out of it... They keep doing what you want them to do. The same applies here. The shares keep the new order running and so are not a waste if you want the new order to keep going. Even if you assume that James keeps all the isk it's still only a scam in the bad sense if you feel bad about spending the isk. I hurt again without loosing one single ship! Its now not only wisse it would be a good way to hurt the Order more if you would send every corp member of the "guy" who send isk into Erotica1 ahh sorry James315 bonus room . Money that other corp member need more or the corp itself. Executive Decisions acted in the best interests of the corp, with the corp's full knowledge and complete support. Frankly we are insulted that you think so little of the rest of us. If you share now the Link: Minerbumping.com in local you share also my information. A lesser man would have moderated your incoherent anti-order ramblings. The Supreme Protector, however, sees the wisdom in letting you spew your nonsense here. Fence sitters across New Eden can see what a bunch of retards populate the rebellion and wisely choose to join the good guys. You sir just became the greatest recruitment tool the Order has ever seen. Thank you! An investment in the new order is an investment in the future of highsec! I have advised the rest of SWORDS REPLACE FEELINGS to purchase shares in the new order as well. Hey Anon we share everything on this website already. use our website traffic to advertise something. Please contact James 315 for add space and pricing. Great stuff. I love the savages orbiting a rock with a laser part. I look forward to hearing from this bright new corp in the future.